Play the specified LED animation. There are four options: "rainbow", "spindrift", "meteor", and "firefly". When HaloCode starts up, the LED animation "rainbow" will be played. Set the LEDs ring of HaloCode to light up in the specified color order. When HaloCode starts up, the LED ring will light up in the specified color order. Light up the LED ring in the color order rotated clockwise the specified number of leds. 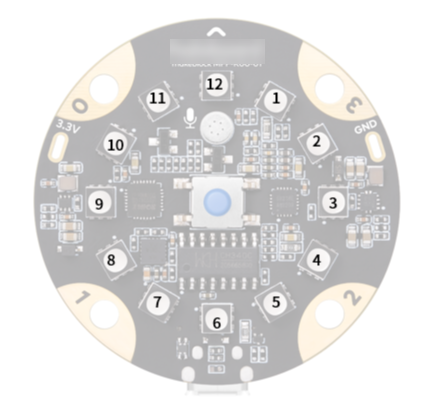 When HaloCode starts up, the LED ring will light up in the specified color order. One second later, the LED ring will light up in the color order rotated clockwise one LED. Light up all the LEDs the specified color. When HaloCode starts up, all the LEDs will light up green. Light up all the LEDs the specified color at the specified brightness. When HaloCode starts up, all the LEDs will light up green at 80% brightness. Turn off all the LEDs. 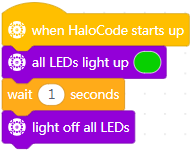 When HaloCode starts up, all the LEDs will light up green and go off after one second. Light up all the LEDs a specified color, mixed by specified RGB color values. When HaloCode starts up, all the LEDs will light up red. Light up the specified LED the specified color, mixed by specified RGB color values. When HaloCode starts up, LED 3 will light up red. Turn off the specified LED. 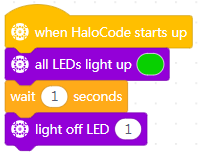 When HaloCode starts up, all the LEDs will light up green. One second later, LED 1 will go off. Display percentage with the LED ring. When HaloCode starts up, the LED ring will show current loudness by lighting up its LEDs.